Using continuous integration for rainbrurph, I need the mongodb database and C libraries. Unfortunately, I had issue using it on Ubuntu Precise 12.04 LTS, the distribution used on travis-ci. 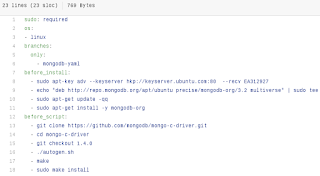 install database components from the official MongoDB repositories;manually build the latest release of the official C libraries;add /usr/local/ to ld.conf to make your build system discover the newly installed library.